When kids share a room, it can go one of two ways. They will either love it. Or dislike it. Sometimes sharing a room will be out of choice. But occasionally kids need to share a room out of necessity. However, when it comes to creating a bedroom and encouraging your kids to like the new set up here are some things you can do to make it more fun. Get them involved in creating a new bedroom. You have decided that for one reason or another your children need to share a room. But this is where you need to get a little creative. Perhaps the room belonged to one sibling already. Or was just a spare room. Either way, it’s worth re-decorating to make the room ready for the kids. This is perfect opportunity to get the kids involved. Making their room much more appealing. Allowing them to be a little creative will make the room seem much more fun. TIP 1 – Let them choose the wall colour. It needs to be something they both like, or even allow them a wall each to choose their favourite colours. TIP 2 – Commission your kids to create some artwork to decorate the walls. You may have artistic children or someone who just likes to smear paint on the paper. However, whatever they create will look brilliant on the walls and will make your kids super proud. Invest in some new furniture. If they are about to share a room, it’s obvious you will need to invest in some new furniture to accommodate. You may need to replace existing wardrobes with bigger ones. Add some more drawers or storage space for toys and belongings. You may need to consider their sleeping arrangements. 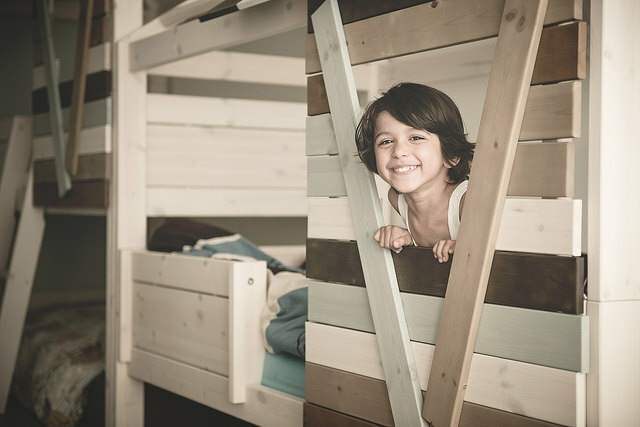 Cuckooland’s Bunk beds for boys and girls could provide the answer. TIP 3 – Give them an opportunity to have some involvement in the choice of furniture or beds. They are going to spend a lot of time in that room so it would make sense for them to like it. Plus it will save you some earache in the long run. Not all children are the same. Some might be into reading, others sports. This is where you need to abide by their individuality. It would be wonderful to create their personal spaces within the shared room that embraces their personality. TIP 4 – Look at what your child would enjoy the most and then create a little space for it. You could create a reading nook for a bookworm, or a lounge area with a games console for a gamer. TIP 5 – Create some ground rules. Let the children decide on a few factors involving their room. It will all come down to compromise but could make for a happier more fun environment in the long run. Our children are much happier if we can keep them in their routine with as little disruption as possible. TIP 6 – Make bedtime more relaxing and honour their sleep patterns. Trying to change things might not work, so honour what they are used to and work round it. TIP 7 – Finally give them some responsibility. Children love a sense of ownership and responsibility placed on them by parents. So go with it for their new bedroom. I hope these tips help you for any future transitions you need to make.